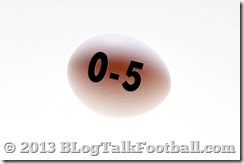 Breaking Goose Eggs–Which Winless Team Gets First Crack? We already saw the New York Giants leave Chicago with the Goose Egg shell still intact. The winless Giants played a good game with Brandon Jacobs rushing for 106 yards and two touchdowns in their 27-21 loss to the Chicago Bears. If you could take away the 3 interceptions thrown by Giants QB Eli Manning, this game is a victory for New York. I donât see the Giants getting their confidence back until a home victory. But unless they take advantage of the next 10 days to get on the same page offensively, the home game on October 21st on Monday Night Football against the 1-3 Minnesota Vikings could be Josh Freemanâs first victory as a Viking. How surprising would it be for the 0-5 Jacksonville Jaguars to stun the 5-0 Denver Broncos in their home stadium? Letâs just say that if that were to happen, the Jaguars defensive coordinator would instantly be demanding a raise or trying to find a head coaching job. Peyton Manning is on a tear right now. The Broncos scored as many points on Sunday against the Cowboys as the Jaguars scored all season. Manningâs preparation in every game lets him accurately predict what a defense will allow him to accomplish in any given situation. Tampa Bay is hosting the 2-3 Philadelphia Eagles this Sunday. The Tampa Bay defense has looked very strong in most of its outings, and the Philadelphia defense has struggled to get off the field. In fact, Philadelphia has allowed 159 points this season by opposing teams. The Bucs have held their opponents to only 70 points for the season, but they will be without their pro bowl right guard, Carl Nicks because of a reoccurrence of the MRSA infection in his foot! While the defense is capable of keeping the score low on the opponent side of the scoreboard, the offense will have to step it up a few notches, and without Nicks to protect rookie QB Mike Glennon, the chances of a high score on the Bucs side of the scoreboard are pretty slim. Their greatest hope lies in putting the ball in the hands of Doug Martin and Jeff Demps with a running attack that has shown promise in the past. 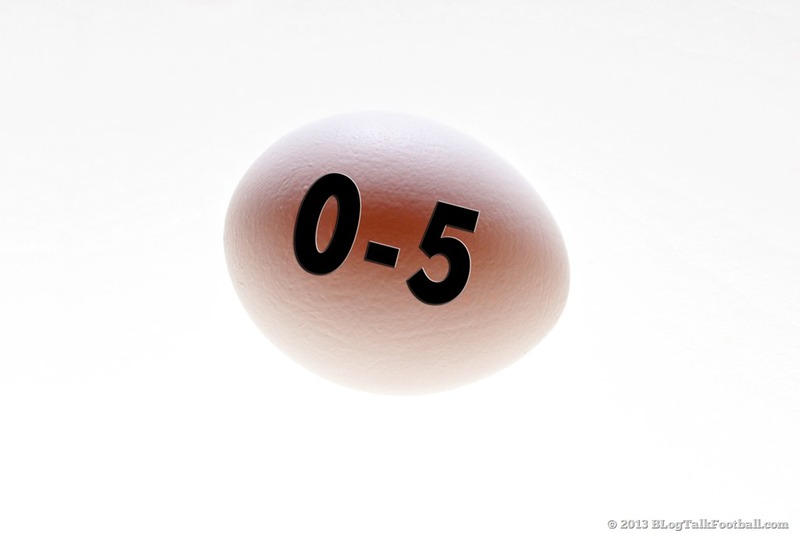 The defense and the fact that the game is sold out in Tampa Bay means the Bucanneers have a chance to crack the eggâ¦ but it remains to be seen. The 0-4 Pittsburgh Steelers have struggled. Both on offense and on defense. Their offensive production resembles their defensive points against in years past. They go up against the 3-2 New York Jets, who have vastly improved on both sides of the ball since last year. The Jets started slowly on offense, but their defense has kept them in games throughout the season. Rookie QB Geno Smith has found a way to win in 3 of the last 5 games, and in the recent game against the Falcons, drove the ball like a veteran in the last minute to put his kicker in position to win the game. Can Pittsburgh go into New York and expect to leave with a digit in the win column? It really depends on the execution of the Steelers offense. Since the loss of Maurkice Pouncey at center, the Steelersâ offensive line has allowed Ben Roethlisberger to be manhandled in the backfield. This has resulted in 5 interceptions to go with his 5 touchdowns. If he keeps giving the ball to opponents, the defense cannot get rested and sustain a strong presence on the field. Coming off the bye week, expect to see a strong showing from the Steelers, but I donât see them pulling out the victory in New York against the Jets defense. My opinion is that the Tampa Bay Buccaneers have the best shot at cracking the goose egg this week. Who do you think will do it?